Haha! No suggestions from me. Our book club read this one and I could hardly finish it. It turned out to be one of the more controversial books are club has discussed! I liked Animal, Vegetable, Miracle, but I know some people find it too preachy and unrealistic. I can't think of any books particularly about eating locally, but I've gotten really into lacto-fermenting lately to help save some of the summer produce for eating later. I recommend Sandor Katz's books, Wild Fermentation and The Art of Fermentation, and Amanda Feifer's Ferment Your Vegetables. Fermenting is really easy and fun! Michael Pollan's books were the ones that got me on the road to eating locally and seasonally and thoughtfully. Even though I'm not American, his books have many universal themes and ideas that can be applied to any locality. I did not like this book much; it was too preach-y for me. My friend recommended The 100 Mile Diet when I told her about this book. I haven't read it yet, though. Hmmm, I don't think I have any suggestions on this one, other than Michael Pollan's food writing. I hope you get some good suggestions! Pollan's the only author who comes to mind for me too! 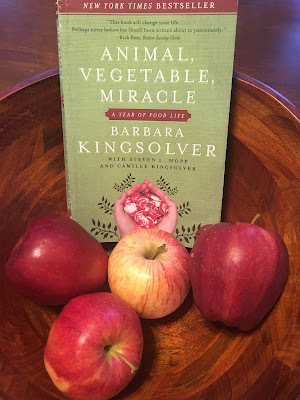 I enjoyed The Poisonwood Bible by Kingsolver, but I still need to check out her nonfiction.